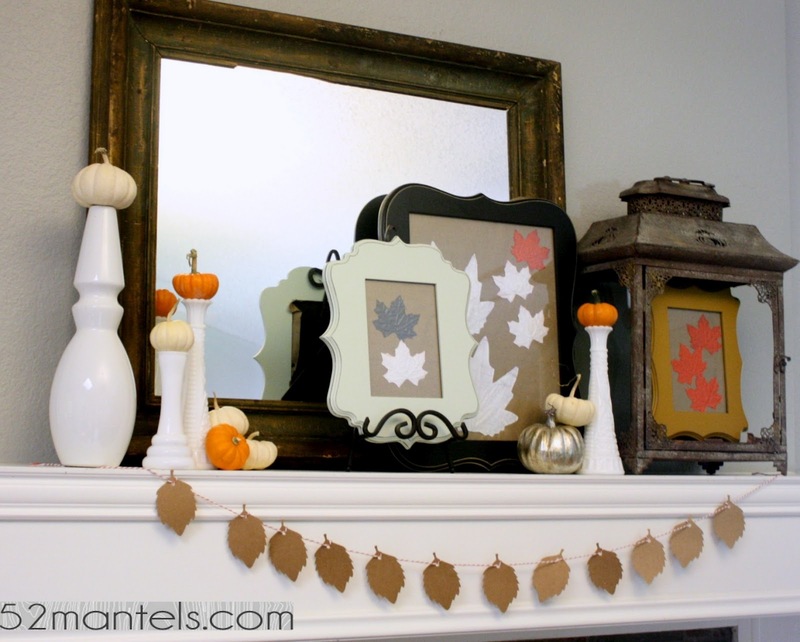 Today I've got the 5 Minute Paper Leaf Garland tutorial I promised you from Tuesday's Fall Mantel (also known as my 51st mantel!). I sat down one night to make this garland. On the TV was Baby Boom (remember that movie with Diane Keaton?). I'd finished and hung my garland before the narrator had finished describing the 80s corporate woman. Diane gave her first line (something about merger, acquisition, power suit, power lunch, get me those files, no ticking biological clock here) as I sunk into the couch with a glass of wine, mantel adorned for Fall. Ahhh. That's the beauty of a 5 minute craft project. Supplies: Twine and Paper leaves. I got my paper leaves from the Dollar Spot at Target. They have a little crafty section right now, complete with bakers twine, gift tags, wrapping paper, stamps. Just plan on handing over your coffee money. If Target sells out of paper leaves, don't fret! You can: 1) print a leaf template, cut it out and trace it onto brown butcher paper 2) look for paper leaves at your local craft store 3) find a leaf stencil at your local craft store 4) use your silhouette or cricut 5) get creative! Directions: 1) remove the string from the ribbon (if applicable) 2) attach the leaves to a length of baker's twine by threading the twine through the top and looping once. Repeat 11 times. Yep! That's really it. It's totally as easy as it looks. Sometimes things are just...easy. 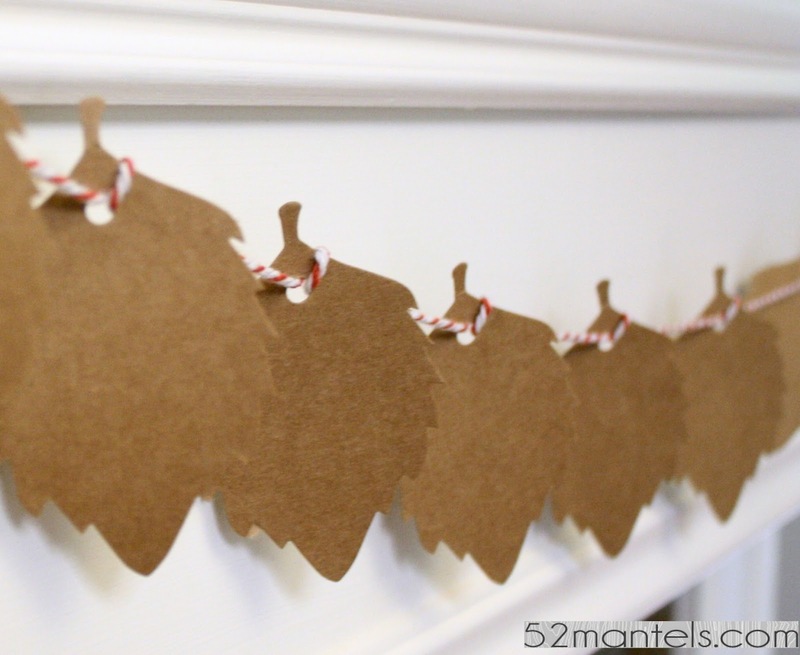 Now, who's feeling a Baby Boom/paper garland night coming on?! So simple! Loving the great Target deals! Thanks so much for sharing this! I think I'm going to try it this weekend! :-) Happy Friday! I'm new to your site and wow that's a lot of mantels! What a great place to start when changing the feel of your home though, I bet you inspire all who "stop by." OOOOH! That is super cute and easy! Love it! So cute and simple! My weekly linky party--One Creative Weekend--has gone spooky this week in honor of my thirteenth party. If you haven’t already, I hope you’ll visit "One Creative Weekend" on OneCreativeMommy.com (open every Fri-Wed) and link up this idea and anything else you’d like to share. (You can include non-Halloween posts as well, but feel free to link up as many Halloween-themed posts as you like.) There are two categories—one for Halloween and one for everything else. It's so easy! 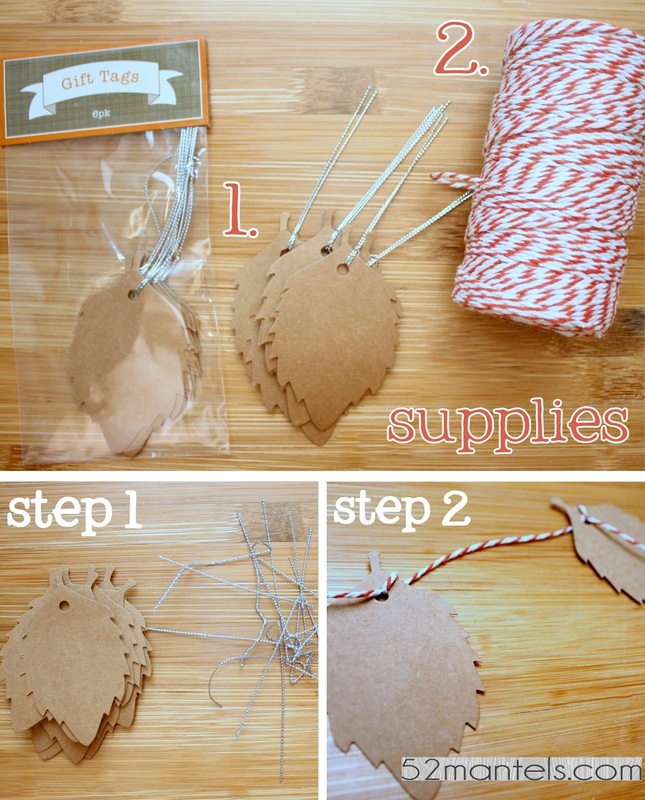 A nice project to try for Fall! Thank you for sharing!